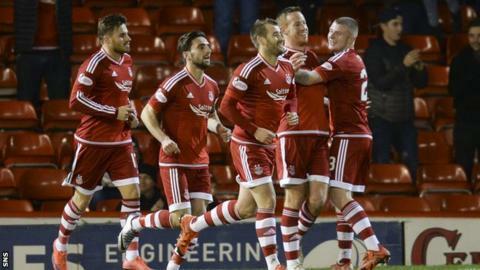 Adam Rooney's 16th goal of the season moved Aberdeen back to within three points of league leaders Celtic as they beat Dundee at Pittodrie. It was the Irishman's fourth in three games against Dundee this season when he forced home a Jonny Hayes cross. The only surprise was that was the only goal of an open and entertaining game as Dundee impressed going forward but were poor defensively. Goalkeeper Scott Bain produced a strong to saves to keep the score down. The result means the Dons will be at most six points adrift of the defending champions when the pair clash at Pittodrie on Wednesday week. The visitors' backline certainly enjoyed a charmed life early on as Aberdeen could have put the result beyond doubt in the first 14 minutes. Dundee have rarely had problems scoring goals, but the fact they have now kept just one clean sheet in their last 16 matches speaks for itself. Their defending at set pieces was particularly poor at times and it took some great saves from ex-Aberdeen man Bain to keep them within touching distance for so long. Recent signing Darren O'Dea in particular had a hard time keeping track of Dons counterpart Ash Taylor and the Dons centre-half was denied on three occasions by the goalkeeper in the first half. Taylor also headed one great chance past the post while Rooney was denied at point-blank range even before he scored his customary goal against Dundee. Hayes took advantage of more poor defending to whip in a cross from the right and Rooney forced the ball over the line at the back post despite Bain's best efforts to save his side again. The standard of goalkeeping was just as impressive at the other end when the visitors' attacking play opened up the Aberdeen backline. Scott Brown marked his first start at Pittodrie since May with a series of important first-half saves to deny the in-form Kane Hemmings. Andrew Considine, in for the suspended Mark Reynolds, also made a vital block to deny Dundee's Gary Harkins a clear scoring chance as play swung from end to end. Paul Hartley's men suffered another blow five minutes into the second half when left-back Kevin Holt was forced off with nasty head cut as a result of a reckless Shay Logan high challenge. Youngster Cammy Kerr was thrown on as a replacement and did better than some of his more experienced colleagues at times, as Thomas Konrad proved. He inexplicably gifted possession to Niall McGinn on his own goalline and was relieved to see Rooney shoot wide of an open goal when picked out by the midfielder's cross. Rooney then miscued when in a good position with 15 minutes left but the Dons fans can overlook that from someone who has scored 10 goals in their last 12 league matches. That has been a major factor in Aberdeen's 10-game unbeaten run in the Premiership that certainly keeps the pressure on Celtic at the top. They did though have a nervy moment at the end when Harkins shot over the bar from close range after O'Dea's knock-on. Match ends, Aberdeen 1, Dundee 0. Second Half ends, Aberdeen 1, Dundee 0. Cameron Kerr (Dundee) wins a free kick on the right wing. Foul by Cameron Smith (Aberdeen). Attempt missed. Gary Harkins (Dundee) right footed shot from the centre of the box is close, but misses the top left corner. Corner, Dundee. Conceded by Graeme Shinnie. Attempt saved. Gary Harkins (Dundee) right footed shot from outside the box is saved in the bottom right corner. Attempt missed. Ash Taylor (Aberdeen) header from the centre of the box misses to the left. Corner, Aberdeen. Conceded by Scott Bain. Kane Hemmings (Dundee) wins a free kick in the attacking half. Substitution, Aberdeen. Cameron Smith replaces David Goodwillie. Graeme Shinnie (Aberdeen) wins a free kick on the right wing. Attempt missed. David Goodwillie (Aberdeen) left footed shot from the centre of the box is high and wide to the left. Corner, Aberdeen. Conceded by Paul McGowan. Substitution, Dundee. Rory Loy replaces Nicky Low. Kenny McLean (Aberdeen) wins a free kick in the attacking half. Corner, Aberdeen. Conceded by Thomas Konrad. David Goodwillie (Aberdeen) wins a free kick on the left wing. Corner, Dundee. Conceded by Shaleum Logan. Attempt missed. Paul McGowan (Dundee) left footed shot from outside the box is too high following a corner. Darren O'Dea (Dundee) wins a free kick in the attacking half. Attempt saved. Adam Rooney (Aberdeen) left footed shot from the left side of the box is saved in the top centre of the goal. Attempt missed. Adam Rooney (Aberdeen) right footed shot from the right side of the six yard box is too high. Jonny Hayes (Aberdeen) wins a free kick in the defensive half.